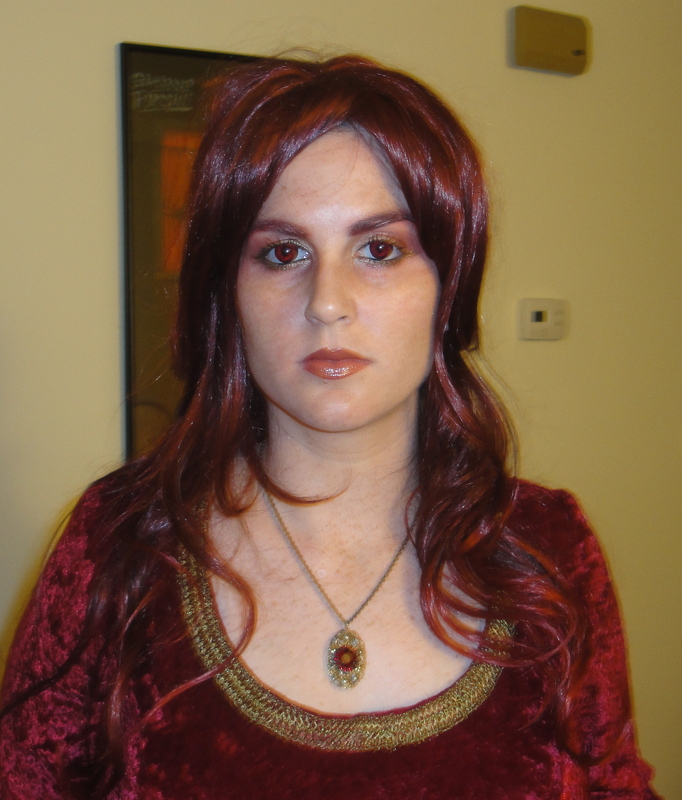 So I am leaving for Dragon*Con crazy-early Thursday morning and only just now managed to do my test-run for Melisandre hair, makeup, and costume. This is partly because the contacts didn’t arrive until last Friday (just in time!) and then I went to Charlotte for the weekend and then I picked up my costume in Raleigh on Sunday from Nancy (really just in time!) so this is the first time I’ve had all the parts together. Red eyes y’all! Look at my red contacts! They are incredible in bright light and since I will be wearing this costume during the Dragon*Con parade I really think the effect is going to be fantastic. The follow pictures are all just wig and makeup–some things need to be left as a surprise after all! Red wig y’all! And red dress and red eyes and red-stone necklace but seriously, red wig! Do you know what the hardest part of the makeup was? The damned eyebrows. My eyebrows are black as night and therefore looked stupid with the red wig. I found an online tutorial that suggested slicking your eyebrows with gluestick and then brushing eyeshadow over them. It worked, more or less, but my eyebrows are just so dark that it really did require quite a bit of coverage. Yeah, I think the eyebrows look pretty all right. 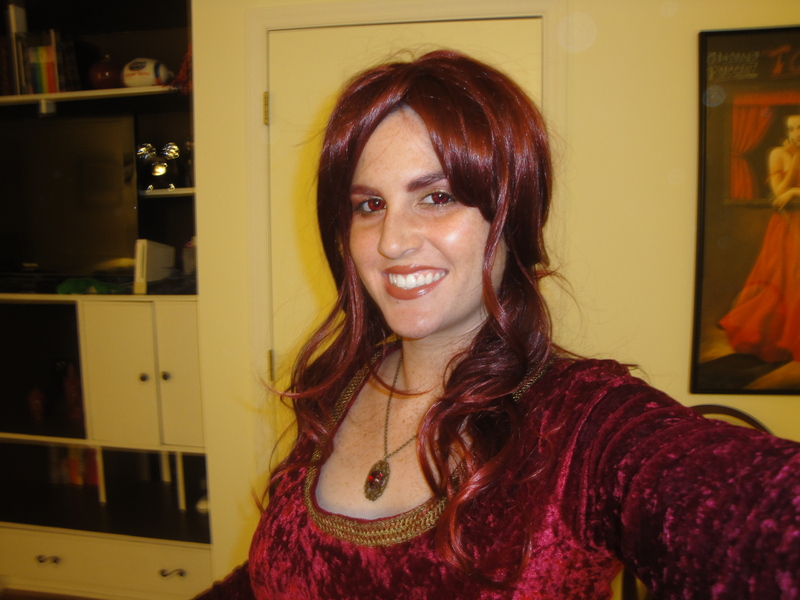 So that’s my Melisandre makeup test run! I am totally loving the red contacts, truly. And, of course, I still have lots to do before Dragon*Con, such as pack and pack and, well, pack some more. Oh and also I need to re-lace some waist cinchers and, you know, pack. One day y’all! Love it! Did I tell you I’m reading all the Game of Thrones books in Paris!? Soon I will know who your character is!! 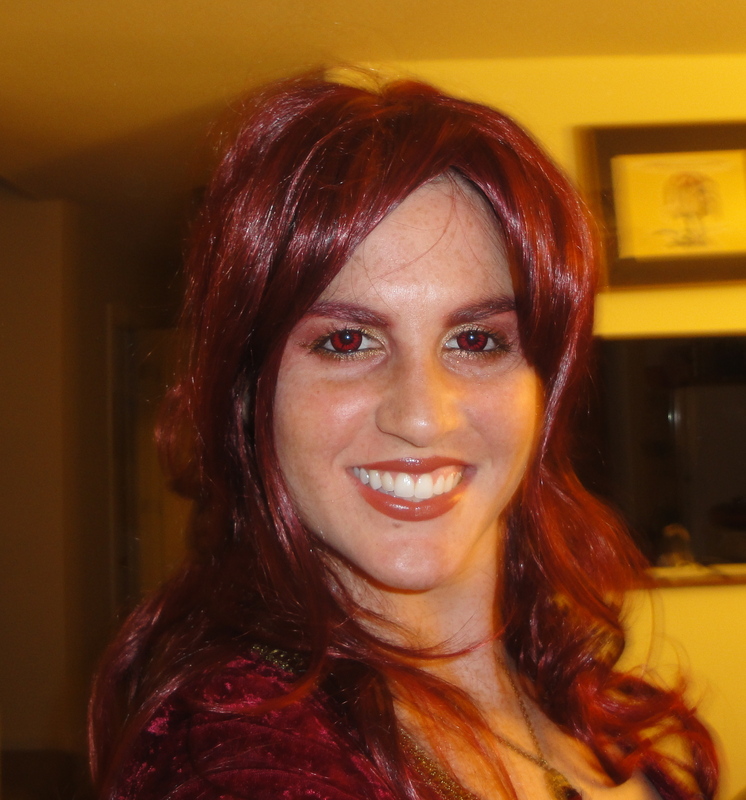 I’m working on my own Melisandre costume for Halloween (and perhaps for next year’s D*Con, as well), and I was looking into red contacts. However, I haven’t had much luck in finding them, and certainly not any that are affordable. May I ask where you got yours? I actually updated my Melisandre this year–I haven’t posted a ton of new pictures of her yet, because i haven’t recapped that day at Dragon*Con, but you can see a preliminary photo of the unfinished dress here: https://thedilettantista.com/2012/08/29/1-day-to-dragoncon-a-melisandre-sneak-peek-and-more/ and also I will be posting about Saturday and Sunday at Dragon*Con soon! The contacts I wore were the same, however. It is unlikely that you will get good red contacts, particularly if you have a prescription, for under $50. Mine were very pricey ($200-ish when I got them, a bit more now–although I have a prescription so it might be less without a prescription), and I purchased them from 9mm SFX, who makes INCREDIBLE FX contacts. They’re the red wolf style. Here’s the site link http://02a5349.netsolstores.com/.